Cootie Coo Creations: Coming soon: COOTIE COO CRAZINESS! Coming soon: COOTIE COO CRAZINESS! You won't believe what we are planning for the weekend of October 1, 2 and 3. This papercrafter's/fiber artist's dream weekend will coincide with the High Springs Riverfest, so there should be something in town for everyone! 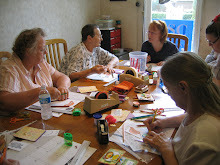 Cootie Coo Creations will be offering a boatload of fun and stimulating classes, including card making, book making, scrapbooking, sewing and quilting, starting at 9:30 a.m. on Friday and running through 4:00 p.m. on Sunday. Details will be coming soon, but block off the days now so you won't miss out on the adventure! Two classes will be held during each time slot and some classes will be conducted in Spanish. Card/Project samples and class prices are available NOW! Click HERE. For those of you looking for an escape to do what you love, don't miss the boat on this weekend of craftiness and fun! Watch for updates and remember to live creatively! !